The loop trip begins at Smokemont Campground, a popular campground through the Blue Ridge Highway. The trail entrance is by the F campsites. For the first 1.5 mi, you will follow a wide horse trail (watch out for the poop!). At the Chasteen Creek/Bradley Fork junction, take the Chasteen Creek Trail. For the next 4.4 miles, the ascent is very gradual. The trail is quiet and serene - a few birds and hikers but generally you will have the area all to yourselves. Once you arrive at the next trail junction, take the Hughes Ridge Trail. This open area is a good spot for lunch. There are no sweeping views in this loop, but the surroundings are beautiful. Your destination is 5 miles away! At this point in our hike (~5000 ft. elevation), we ran into this little buddy. He was hungry, tired, skiddish and quite frankly pretty beat up. Abandoned dogs are frequent in the South. Many are seen as tools for hunting and not as forever companions. Luckily this guy had a collar on. And although the owner didn't seem too enthused that I had found him, I am hopeful that he will be treated well. After feeding him beef jerky and leftover lunch turkey meat, we continued onto Peck's. Once you hit the Bradley Fork/Hughes Ridge junction, it's only 2 miles until Peck's Corner Shelter. You will pass a shed on your right 1.7 miles from this junction. The trail follows the ridge of the mountain with gradual descents. The landscape changes from hardwood trees to conifers. The temperature drops quickly this time of year as the sun goes down, and especially at this elevation. At Peck's you will find a simple wood/stone shelter with a chimney. Tents and hammocks are NOT allowed, and food must be prepared outside the shelter. There is a pulley system to hang out bags away from critters and bears. A few hundred yards down the shelter is a steady water source (that needs to be treated or boiled). Note that Peck's is a hiking shelter only, no horses allowed. The next morning we started a bit later - the sun doesn't rise until 7:30AM this time of year. 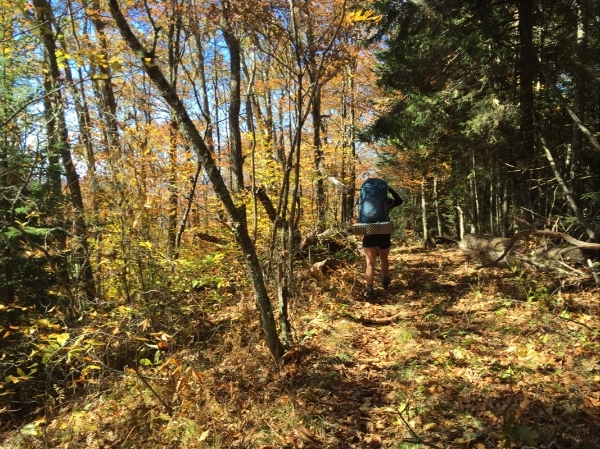 There is an option to continue on 0.2 miles to the famed Appalachian Trail. If you head west on the AT for 6 miles, you will reach Charlie's Bunion, a famous Smoky Mountain rock formation. From there, take the Dry Sliuce Gap trail 4.1 miles until you hit the Bradley Fork junction. From here, it is 4 miles back down to Smokemont. The descent on Bradley Fork is much steeper (aren't you happy to be going down rather than up??). You will be following a stream for the remainder of your trip. There are plenty of opportunities to stop for a snack, play in the water, or refill your water supply! The descent is very quick from here. Once again you will be at the Chasteen junction. There is a horse tie up here, and a great big space for lunch. From here you will connect to portions of the Smokemont Loop - a popular 4 mile loop for the less intense hikers. The horses are back, so watch out for the poop. All in all it was a great time in the Smokies with lots of peace and tranquility.